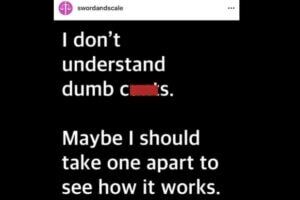 Wondery has dropped the podcast “Sword & Scale” and its host Mike Boudet one day after the host posted a comment about “dumb c—s” on International Women’s Day. “We have decided to part ways with Mike Boudet and Sword and Scale,” the podcast company tweeted on Saturday, one day after a firestorm over Boudet’s latest online provocation. Wondery had declined to comment when TheWrap asked about the post on Friday, and did not immediately respond to a request for confirmation that Friday’s post was the reason for cutting ties with him and his podcast. Boudet responded to Wondery’s decision in a Soundcloud file, and said that “Sword & Scale” will move to its own platform behind a paywall. Omar Sanchez contributed to this story.